Another Penguin Party has a slight silver shimmery base with various silver, green, yellow, red, orange, green and blue glitters. All nails are coats over 2 coats of Sephora Psychedelic. This penguin and the others shown in this post were customs for Wenche, who runs Norway Nails. CandyLandshark is a blend of assorted opaque and translucent white glitters with a rainbow of neons and red and green candy canes in an intense cool pink-shimmered clear base. All bottles are accompanied by nail art glitter (candy canes, snowmen, trees, hearts, snowflakes) in a candy-shaped container. Shown is 1 coat over 2 coats of Sally Hansen Sun Sheen. 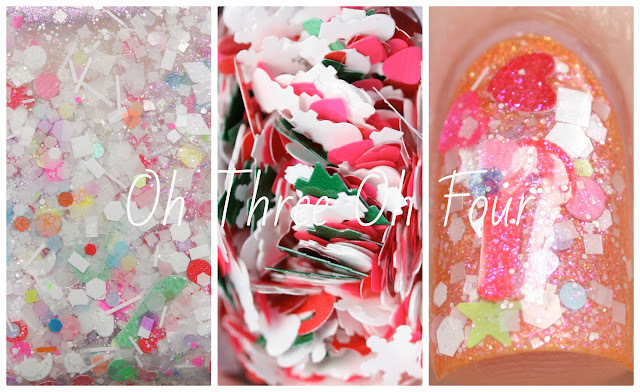 Christmas Club is made with assorted white, red, green, neon pink and neon green glitters in a mint- and warm pink-shimmered clear base. 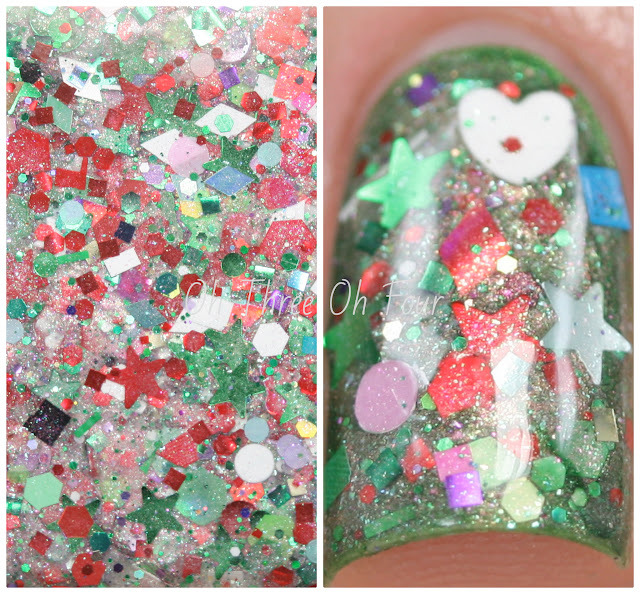 These photos are 2 coats of Christmas Club over 3 coats of Milani Hi-Tech. Christmas Present is a special edition (70 bottles) Lynnderella created as a holiday 2013 keepsake. It contains new Christmas shapes: bells, candy canes, snowmen and snowflakes in a bed of assorted red, green and white glitter plus clear base. Here is 2 coats over 2 coats of Bonita Lime Green. 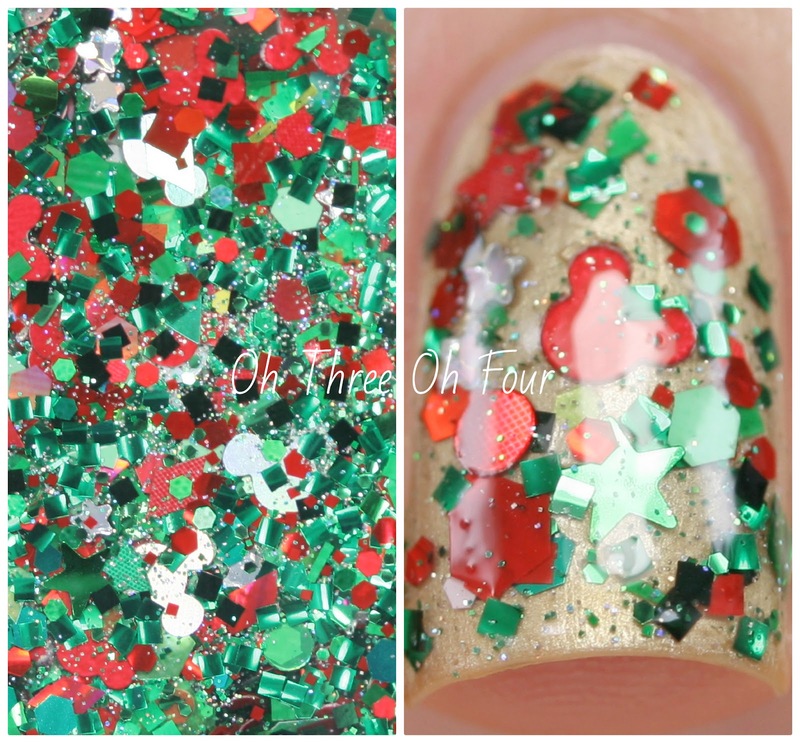 Cookie Exchange is made with assorted red, green and blue glitters accented with red and green clubs in a clear multi-shimmered base. All nails are 2 coats of Cookie Exchange over 2 coats of Sally Hansen Taffeta. 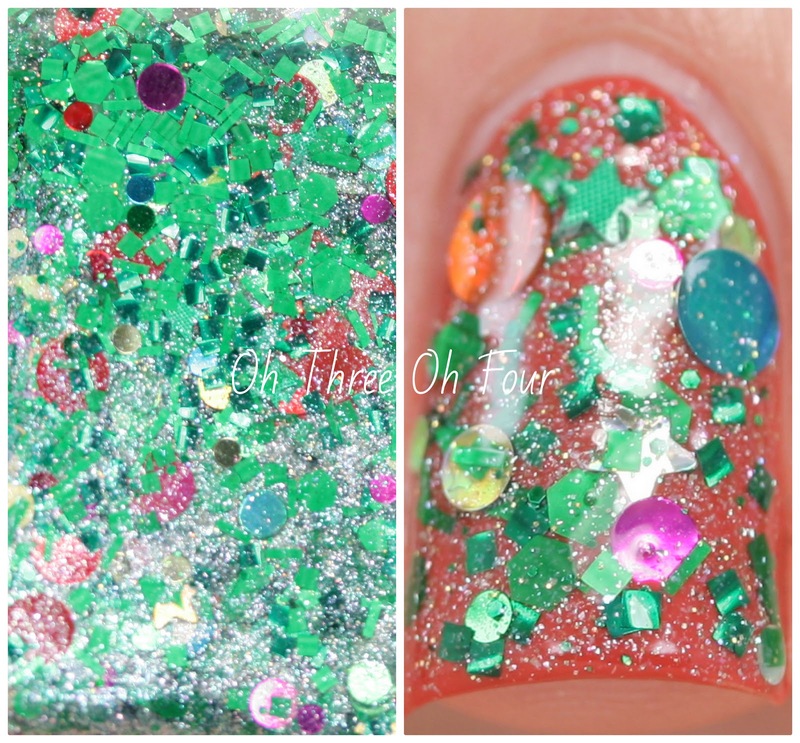 Grinch of the Year contains an assortment of red, green and silver glitters in a green and red shimmery base. 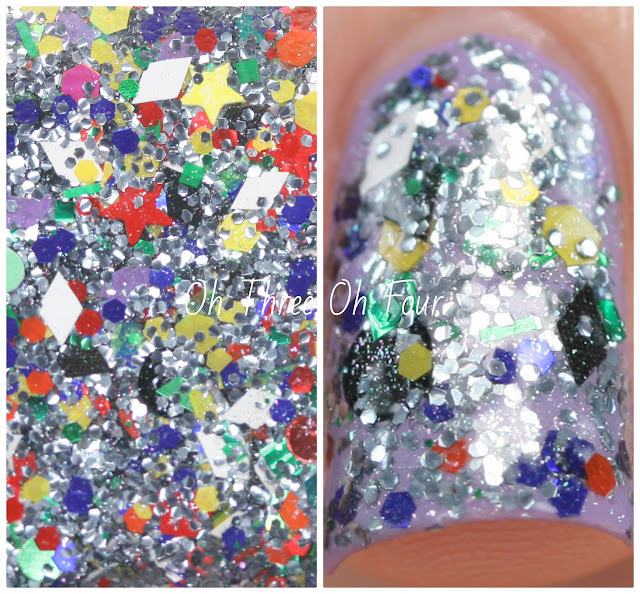 These photos are 2 coats over 2 coats over Revlon Wild Violets. HoloDay Hearts contains a variety of silver holographic glitters including bells, butterflies, hearts and flowers in a clear base with silver shimmer. 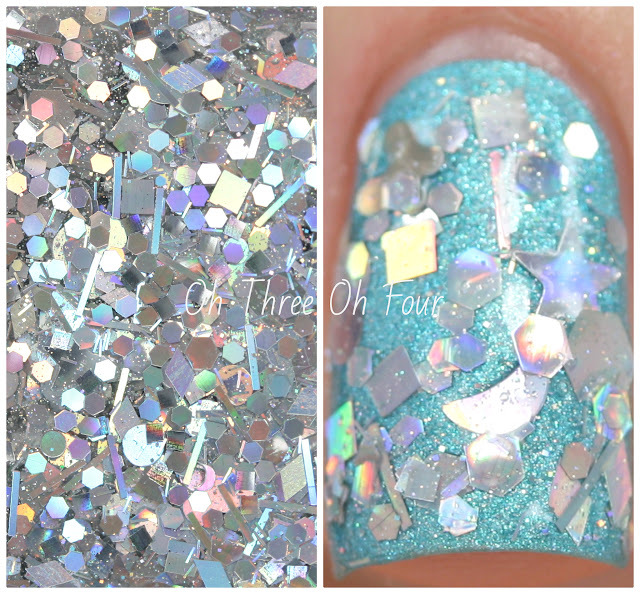 Shown is 2 coats over 2 coats of Sally Hansen Teal Tulle. Mickey and the Snowmen contains red, black and pink mickey heads, white snowflakes and dots, shredded "carrots" and bits of "yarn" in a white shimmery base. Here is 2 coats over 2 coats of Dance Legend Android. Mickey's Making Merry is a seasonal blend of red, green and holographic silver glitters featuring Mickeys and other assorted shapes with micro-glitter and rainbow dust in a clear base. All nails are 2 coats over 3 coats of NYC Virtue. 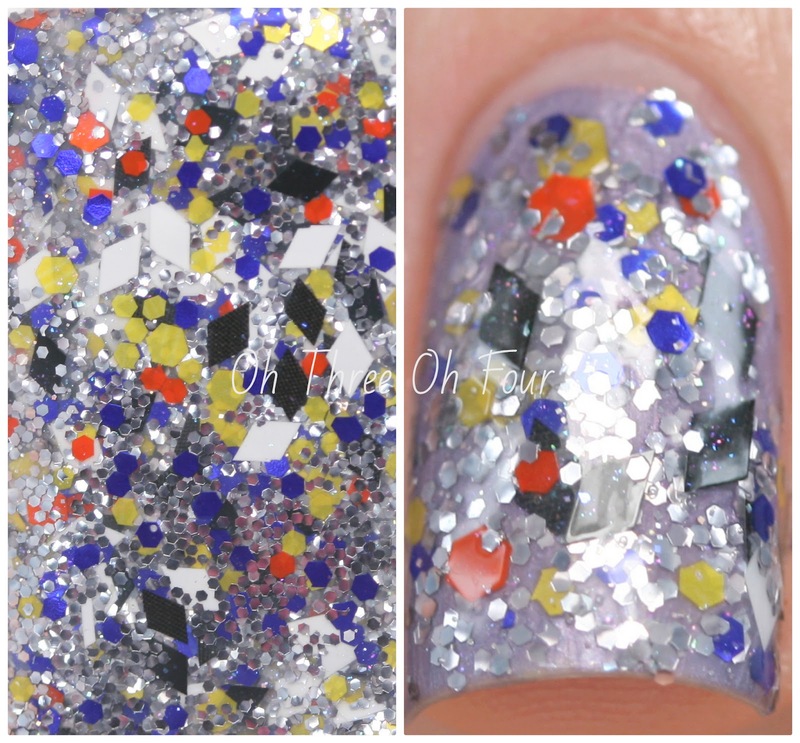 Penguin Party is loaded with silver glitters accented with black, blue, orange, white and yellow glitters in a clear base. Shown is 2 coats over 2 coats of Revlon Moonlit Woods. Penguin After Party! is an assortment of silver, yellow, orange, red, blue, white and green glitters in a silver shimmery base. 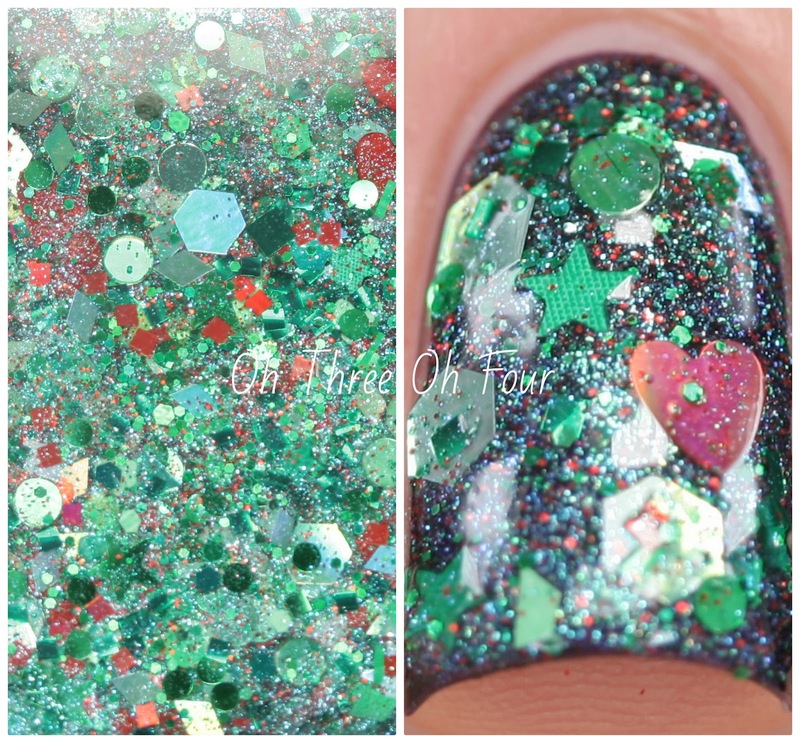 These photos are 1 coat over 2 coats of Jessica Prima Donna. Red-Nosed Unicorn (Red Version) is made with red and neon glitters in a pink-shimmered translucent red base. Red-Nosed Unicorn (White Version) contains assorted opaque white with almost-red neon and assorted neon, blue iridescent glitters with intense blue shimmer in a clear base. This duo comes with added glitter containing snowmen, hearts, snowflakes, Christmas trees and other assorted non-solvent-resistant shapes. My index and middle nails are 2 coats of the red version over 2 coats of Sephora X Kapow!. My ring and pinky nails are 2 coats of the white version over 2 coats of Sephora X Hyped. We Need More Tinsel! is made with assorted deep green glitters accented by assorted metallic and holographic dots, stars, rainbow dust and plentiful white shimmer. All nails are 2 coats over 2 coats of Obsessive Compulsive Cosmetics Psycho. 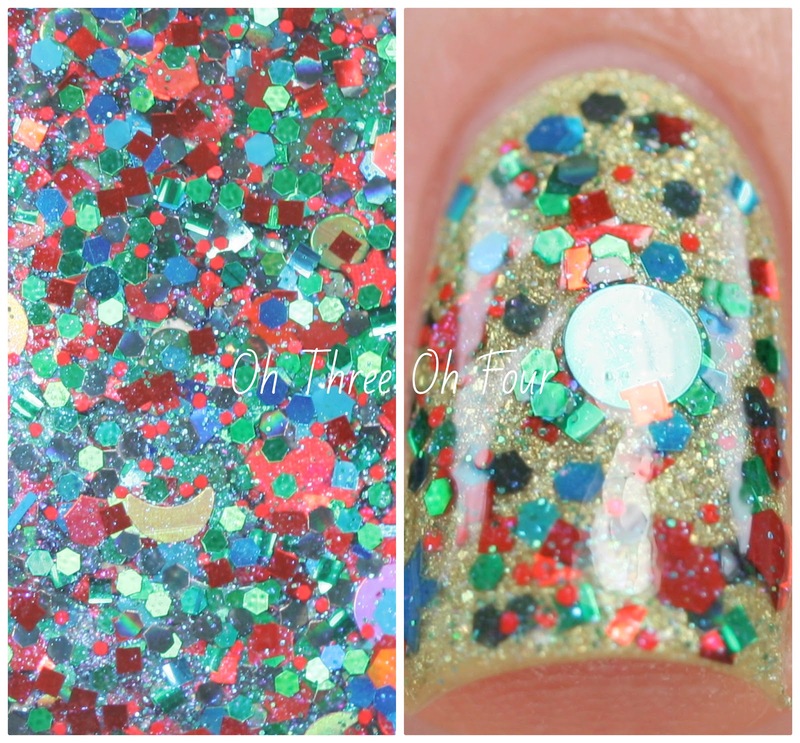 Lynnderella limited edition and core lacquers can be found through Lynnderella.com. 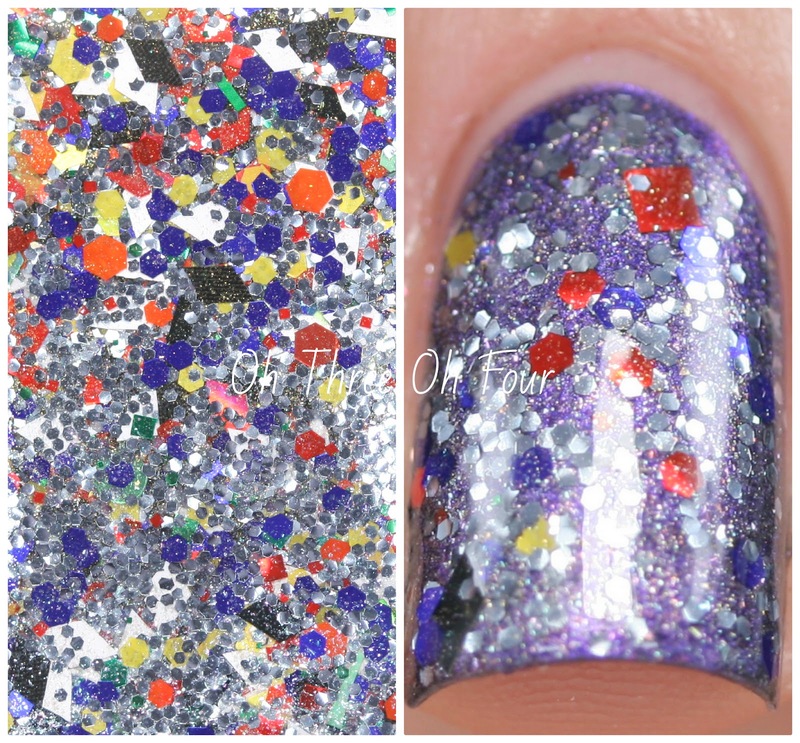 If you are international and interested in core polishes make sure to check out Norway Nails and Glitter Connect! Follow the Lynnderella fan pages on Facebook, Twitter, Instagram, Pinterest and Tumblr. Silly Bee's Chickadees Fairy Slap Giveaway! Lynnderella 'Twas the Sixth of December Winners!